Choosing to complete a graduate degree is a defining moment. It’s challenging to fit education into a busy schedule. Caldwell offers solutions with nationally accredited programs, including several available 100% online. In support of the University’s Dominican Catholic tradition of commitment to higher education, our mission is to provide lifelong learning opportunities to students of all ages, backgrounds, and interests. We offer flexible yet challenging career-related degrees and programs that prepare students with advanced knowledge and skills appropriate to specific professional goals. 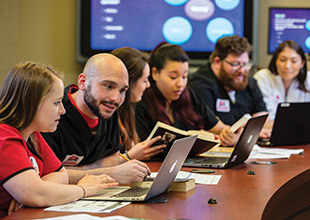 The hallmarks of a Caldwell University education are small class sizes, individual attention, and a quality faculty and staff committed to our students. We currently serve approximately 600 graduate students enrolled in avariety of programs in the following disciplines: Applied Behavior Analysis, Business, Counseling, and Education. Whether you choose to pursue a master’s degree, a graduate or professional certificate, or a doctoral program, we are confident you will be challenged intellectually and enriched academically. Caldwell University offers two graduate degrees in Business: the Master of Business Administration (MBA) and a Master of Science (MS) in Accounting. This program is accredited by the Accreditation Council for Business Schools and Programs (ACBSP). The MBA program offers a rigorous 33-credit curriculum that has been carefully prepared to meet the demands of a 21st-century business world. The MBA program is also offered in a fully online accelerated format, allowing students to finish quickly and complete their MBA on their own time from anywhere at a reduced tuition rate! The MS in Accounting is designed for those who wish to specialize in accounting at the graduate level. Given the requirement for 150 academic credits in order to qualify for CPA licensure in New Jersey and many other states, the MS in Accounting is an ideal program for students anticipating a career as a CPA. The Graduate Division of Business prides itself on its connection to the business community, which results in excellent internships and job opportunities as well as practical benefits from interactions with guest speakers and mentors. Caldwell Business graduates are employed by a variety of major corporations, such as ADP®, Citibank®, Goldman Sachs, Merck, Pfizer, Prudential, and PWC, as well as other well-known companies in a variety of business fields. Since these programs are geared toward both the technical and soft skills of business, Caldwell produces a well-rounded student who can meet the demanding needs of today’s competitive corporate and nonprofit environments. Caldwell University offers a number of programs that help prepare educators to become leaders in their fields and strengthen the education of our youth. Caldwell’s Teacher Preparation Program is accredited by the Council for the Accreditation of Educator Preparation (CAEP) through October 2020. The accreditation certifies this program has provided evidence that the program adheres to CAEP’s quality principles. Caldwell University’s Master of Arts (MA), Post-master, and Doctor of Philosophy (PhD) in Applied Behavior Analysis (ABA) programs provide students with the skills and experience to become leaders in the field of applied behavior analysis. Through course work, participation in applied and research practica, and completion of an empirical thesis or dissertation, students develop a strong foundation in the science of behavior analysis to explain behavior and to apply these basic principles to improve individual and social conditions. The master’s and Post-master programs meet education and experience requirements to prepare graduates to become a Board Certified Behavior Analyst (BCBA). Caldwell’s graduate programs in Counseling prepare students to work effectively in a variety of settings as mental health counselors, school counselors, and art therapists. The three areas share a number of core courses and provide specialized education in their unique focused areas as well. A central component of Caldwell University’s programs is the integration of spirituality, enabling students to incorporate this important dimension in concert with conventional practices. All three areas of Caldwell’s graduate programs in Counseling have received accreditation from the Council for Accreditation of Counseling and Related Education Programs (CACREP). In fact, our MA in Counseling with Mental Health Counseling/Art Therapy Specialization was the first Art Therapy program in the country to hold CACREP accreditation. Professional school counselors are certified/licensed educators with a minimum of a master’s degree in School Counseling, making them uniquely qualified to address all students’ academic, personal/social, and career development needs by designing, implementing, evaluating, and enhancing a comprehensive school counseling program that promotes and enhances student success. The MA in Counseling with Mental Health Counseling Specialization is a rigorous 60-credit degree program that prepares students to effectively function as clinical mental health counselors in a variety of human service settings. Graduates of this program will hold a master’s degree that fully satisfies the course work requirements for licensure in New Jersey as a professional counselor. The MA in Counseling with Mental Health Counseling/Art Therapy Specialization is a uniquely designed, 63-credit interdisciplinary program that prepares students to effectively function as mental health counselors and art therapists in a variety of human service settings. The program integrates the practice of art therapy within the mental health counseling model, reflected in educational philosophy, course readings, and course content. The program is accredited by the Council for Accreditation of Counseling and Related Educational Programs (CACREP) and approved by the American Art Therapy Association. Graduates of the program meet educational requirements for registration as an art therapist as well as requirements to become a Licensed Professional Counselor in New Jersey.